One of New Orleans' best known acoustic roots acts, Jeff & Vida have recently relocated to Nashville TN. With three critically acclaimed records under their belt and five years of rigorous touring both nationally and internationally, the duo make big impressions wherever they go. Performing original material spanning from Appalachian bluegrass to alternative country. 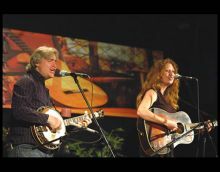 Their live performances showcase Vida’s powerful voice and Jeff’s superb picking on mandolin, guitar and banjo and tight well arranged harmonies. With ballads that sound like they could have been written fifty years ago and raucous barnstorming numbers that keep your feet tapping their live shows are exciting and unique, full of humor, good music and unforgettable songs.